The Department of Pediatric Surgery at KGMU began in 1970 as a pediatric surgical service. This was elevated to a separate Pediatric Surgery Unit in the Department of Surgery in 1978 and later to a separate department in 1998. The newly created department has Medical Council of India approval for MCh course in Pediatric Surgery leading to the degree of MCh in Pediatric Surgery. Two candidates are admitted every year to the 3 year course. The department provides state of the art neonatal and pediatric surgical facilities to the children of the state. Referral from adjoining states of Bihar and Madhya Pradesh, and adjoining countries - Nepal and Bhutan are also admitted here. Special areas of interest are congenital short colon, esophageal atresia, tracheo-esophageal fistula, anorectal malformations, ectopic ureter and exstrophy bladder. Recently gastrointestinal endoscopy, bronchoscopy, urological endoscopy and therapeutic procedures have been started. The department has pioneered a new, one step surgical procedure for exstrophy bladder which can be performed in newborns. Research areas include congenital malformations, spina bifida, surgical nutrition, portal hypertension and Hirschsprung's disease. One research project underway. More than 200 papers, posters, guest lectures and orations in state level, national and international conferences have been presented. Additional academic contributions include 18 papers in national and 21 in international journals, 7 book chapters and 4 review articles by different members of the faculty. Organised the Annual Conference of Indian Association of Pediatric Surgeons in 1995 and International Workshop on Anorectal Malformations in 2003. The department has a bed strength of 32, including 8 neonatal intensive care cots. The department is equipped with incubators, nebuliser, neonatal ventilator, heating blankets and all gastrointestinal, urological and airway endoscopes (flexible and rigid). The bed occupancy rate is 125%. The annual OPD attendance is about 4500, while inpatient admissions number about 1200 annually. 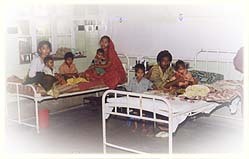 About 1000 operations are performed every year, of which about 500 are major procedures and 260 are on neonates. This workshop is being organised by the Department from 10th - 12th February 2006. Exstrophy bladder though uncommon, is a challenge in pediatric surgery. Over the past few years, advances have occurred in surgical treatment with increasing tendency for single stage repair of the entire anomaly. In western countries, segregation of cases to specialised centres occurs. Due to the rarity of the condition, there have been few opportunities for observing the correction of these anomaies in the hands of experts. The workshop will bring together a panel of experts in the field who will demonstrate the operative procedures in 6 sessions. Besides, there will be lectures and symposis to cover the entire topic from embryology to failed repair.